National Physical Planning Department is engaging in updating of the National Physical Plan which is developed for about two decades with foreign technical assistance. 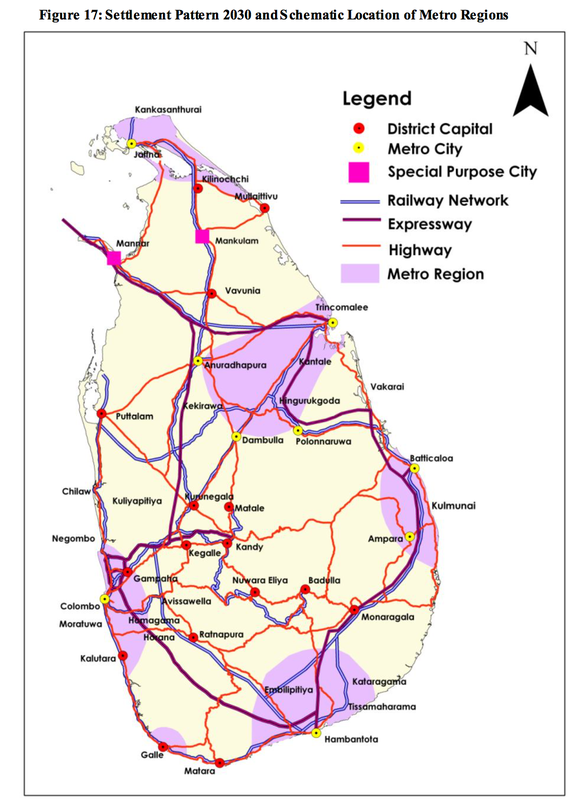 The plan was published in 2010 during the Mahinda Rajapaksha ruling the country. The development process already undergoing according to the plan without any change even after the changing of the government. Some people see it as a necessary process to develop the country as the Sri Lanka known as developing country for decades even after the independent from British control. What is going on in the background not clear to the people. There are attractive constructions in Colombo city and some other areas of the country. Roads have been newly constructed and renovated with modern carpeting technology. New reservoirs have been built. New pwer generation plants are built and continue to building. But those activities do not show the whole picture. There will be 5 metro regions in the country by 2030 which concentrated all the intrastructure facilities including highways, schools, Power and water suply etc. The Government plan is to make it move people to metro regions from the areas now they live and use the vacate lands as large scale agricultural areas. Development is needed with the time for a country. but it should be with the people - for the people process. Half of the countries population moving into 5 metro regions in the name of development and grabbing of resources will not make difference in peoples lives except they become slaves of in their own country.